Hey Pronto Fans, welcome to our new bi-weeky column, The Crusty Curmudgeon’s Comic Classics, written by David Torsiello. David focuses on titles that are largely forgotten today, though their influences can often by felt in modern issues. Here’s Part I of David’s first post, about the oddball 1976 Marvel comic, Omega the Unknown. Omega the Unknown: Greatest Comic Book Ever? What was the best comic book ever? Ask ten people and you could get as many answers. Usually, though, the debate boils down to a just a few possibilities: Watchmen. Dark Knight Returns. Maybe Ghost World or Love and Rockets if you’re of a more alt-comix bent. Sandman. Maus. I’m probably the only guy you’re ever going to meet who would make a case for the 1976 Marvel title, Omega the Unknown. At the very least, Omega was a comic that was ahead of its time. Maddening inscrutability was its hallmark nearly fifteen years before Twin Peaks and almost thirty before Lost. The strip features a twelve-year-old kid with a most uncommon intellect and an even more uncommon personality, to go along with a title character that does not utter a single word until the fourth issue—and even then it’s just a single word (“Why?”). He won’t speak again after that until the seventh issue, where we get a whopping four words out of him (“secret” and “I am sorry”). Not only does the guy not speak, he doesn’t even get thought balloons. Not one; not ever. Intrigued yet? In addition, the book featured powerful social commentary, as it managed to vividly capture the poverty, violence, and generally desperate atmosphere of the New York City of that era, despite the suffocating constraints of the Comics Code Authority (which still had some teeth in those days). Written by Steve Gerber (the godfather of modern comic-book weirdness) and Mary Skrenes (a relative unknown at the time) and penciled by Jim Mooney (a pro’s pro and an excellent illustrator, but one whose style was not exactly what you’d call “flashy”), there probably was not a lot of buzz among the general comics-reading public regarding Omega upon its launch. In Marvel’s “Bullpen Bulletins” the month before the first issue’s release, it received a brief mention (along with Black Goliath, another title set to premiere at the same time) and a small illustration of Omega by John Romita. However, Gerber & Mooney had recently done some good work together on Man-Thing and Son of Satan, so among Gerber aficionados (and there were more than a few back then), there was probably some degree of excitement and anticipation. The first issue begins with a full-page splash of Omega dramatically running against the backdrop of an alien landscape. With one look, the reader knows this is the 1970s, as Omega has that Brady Bunch man-perm that Greg, Peter, and Mr. Brady all shared in the show’s final seasons. He’s also sporting thigh-high boots and a headband. (Be warned: If you’re not old enough to remember when such style was fashionable, you might find it a bit distracting.) 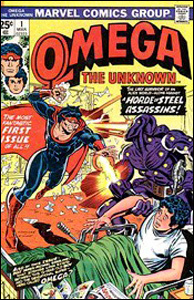 The first issue of Omega was cover dated March 1976 and the last October 1977. That’s the heart of the seventies, and the series is very much a product of its era in terms of style. Pages two and three continue with this narrative style as we watch Omega battle a bunch of faceless humanoid robots, displaying great strength as well as the ability to emit bursts of energy from his hands. Eventually, he gets knocked down by one of the robots with a ray gun blast from behind. As he appears to cry out in pain, we cut to the earthly home of James-Michael Starling, who is suddenly sitting up in his bed, also crying out in pain. James-Michael’s parents enter to see what’s wrong. His mother asks if he can remember the dream that has interrupted his sleep. All James-Michael can recall is a feeling of “terrible cold” and “desolation.” Almost immediately, the kid steers the conversation toward his not wanting to leave the family home in the mountains to attend school in New York City. It seems he’s lived most of his life in isolation, home-schooled by his parents, and feels no need to alter this arrangement. His father won’t hear of it and insists that they will be leaving their mountain home, as planned, the next day. The recap above doesn’t do these family scenes justice—they really need to be read firsthand to appreciate their peculiarity. The twelve-year-old James-Michael displays the emotional range of Mr. Spock while speaking with the vocabulary of a seventy-year-old, retired English lit professor, and his parents sound like…well, we’re about to get to that. On the family’s fateful car ride the next day, there’s a head-on collision with a truck. James-Michael briefly awakens by the side of the road to see his mother’s disconnected head, with metal and wires dangling from her neck, and hear her/it assure him that he’ll be alright, adding this one simple warning: “Don’t listen to the voices. It’s dangerous to listen.” Then the head melts away into slag and James-Michael passes out once again. Robot parents. The plot thickens. After another cutaway to two pages of Omega pulling free of his magnetic bonds, commandeering a small spacecraft, and escaping his violent homeworld, we return to James-Michael in a hospital bed, where he has just awoken from a coma after nearly a month. He’s in the Barrow Clinic in New York City and his nurse happens to be Ruth Hart of Man-Thing fame. Despite the trauma he’s been through, James-Michael remains remarkably calm. Or perhaps more accurately, disturbingly calm. Later, Dr. Barrow will remark to Ruth that he’s fascinated by the mystery surrounding this boy—from his abnormal psychological state, to the fact that there was “no trace of flesh and blood in the car crash.” It’s a mystery he’s determined to solve. Under orders from Dr. Barrow, Ruth tries to get closer to James-Michael in an effort to get him to open up, but fails miserably. Meanwhile, the clinic’s board of directors is putting pressure on Barrow to cut the kid loose since, orphaned as he is now, he’s a charity case they cannot afford. So Barrow makes arrangements for James-Michael to move in with Ruth and her roommate, Amber Grant. Amber visits the clinic to introduce herself to James-Michael right before the move is about to take place. As a character, Amber is Ruth’s polar opposite. Whereas Ruth is sweet and kind, Amber is willfully (and delightfully) unsentimental, streetwise, and tough. Shortly after meeting James-Michael for the first time, she takes to calling him “punk.” While Ruth couldn’t seem to make any kind of connection with him, James-Michael takes a shine to Amber immediately—a shine that is, perhaps, slightly more than platonic in nature. Just as suddenly, Omega makes the scene. Upon seeing him, the robot shines its beam on Omega, stating matter of factly, “Re-evaluation is called for.” Omega battles the robot as James-Michael watches. At one point, the robot has Omega cornered, gun drawn and about to fire, when James-Michael instinctively raises his hands…and out comes that same burst of fire-like energy we saw Omega use earlier. The robot is struck by the burst and collapses. Omega looks at James-Michael and smiles, saying nothing. James-Michael tells him that he wanted to help him, that he’s seen him before in his dreams. Omega does not respond. In silence, he picks up the robot and leaves. At this point, Dr. Barrow runs in to find James-Michael on his knees, steam rising from his hands. Upon examination, the doctor discovers what appears to be the Greek letter omega seared onto the palms of both the boy’s hands. To be continued next issue. So what the @#$! is going on here?? Come back in two weeks for Part II, in which you’ll learn about the creation of this unusual series, as well as David’s unique perspective and analysis of the title’s legacy.